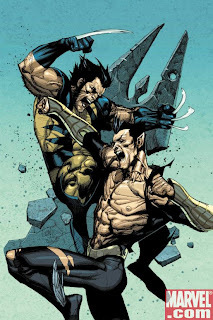 Comics Impulse v2: Wolverine vs. The Sub-Mariner?!? 900 Americans are dead and S.H.I.E.L.D. is pointing the finger at Namor! In Sub-Mariner #3, Namor races against time to find the location of the rogue sleeper cell agents before they commit more heinous crimes in the name of Atlantis. But is he ready to battle Wolverine? Writers Matt Cherniss and Peter Johnson (/Powerless/) and up-and-coming artist Phil Briones (/White Tiger/) are making waves with the new limited series about Marvel's first mutant and his constant struggle against the "weaklings" of the surface world. Also, this action-packed issue features magnificent cover art by Young Guns Reloaded star Leinil Francis Yu (/New Avengers/). After plowing through Iron Man and his armada of S.H.I.E.L.D. submarines, Namor searches for his old ally, Charles Xavier, only to find the Canadian berserker ready and waiting for a scrap at the gates of the X-Mansion! Meanwhile, sinister figures are lurking in the shadows; the rogue Atlanteans make plans to murder their "traitor king," but the vicious Venom might beat them to the punch if he develops a taste for seafood! The conflict heats up in Sub-Mariner #3; will all of this tension lead to an inevitable war between Atlantis and America ... and more importantly, will that war result in Namor's death? One thing is certain, the monarch of the seas won't go down without a fight – Imperius Rex! Marvel Comics is a division of Marvel Entertainment, Inc., a leading global character-based entertainment company that has developed and owns a library of more than 5,000 characters, which have entertained generations around the world for over 60 years. Marvel's operations are focused in entertainment and consumer product licensing and comic book publishing. Marvel Studios supports the development of feature films, DVD/video products and TV series.